Domaine de Saint Siffrein enjoys a long history in the Southern Rhone valley as it was founded in 1880 by Abel Chastan. Domaine de Saint Siffrein is still owned by the same family, the Chastan family today. However for much of the time since the estate was created, the harvest was sold to negociants. That began to change in 1950, when they began producing, bottling and selling their own wine. Cyril Chastan a direct descendant of the founder has been in charge of managing Domaine de Saint Siffrein since 2005, when he took over from his father, Claude Chastan. Domaine de Saint Siffrein owns 14 hectares of vines in the Chateauneuf du Pape appellation. 13 hectares are used to grow red wine grapes. 1 hectare is reserved for the production of white wine grape varieties. The vineyards are well placed in the northwestern part of Chateauneuf du Pape, in the Cabrieres and Palestor lieux-dits. The vineyard is managed using biodynamic farming techniques. In 2012, Domaine de Saint Siffrein was certified Agriculture Biologique. However, Domaine de Saint Siffrein can claim credit for being one of the first vineyards in Chateauneuf du Pape to practice organic farming, which is something they have been doing since at 1980. Domaine de Saint Siffrein produces 2 red Chateauneuf du Pape wines and one Chateauneuf du Pape Blanc. They also own 4 hectares of vines in the Cotes du Rhone. Domaine de Saint Siffrein Chateauneuf du Pape is a blend of 65% Grenache, 15% Syrah, 15% Mourvedre and 5% Cinsault from vines that are at least 60 years of age. The terroir is mostly galets, but there are also soils with clay, sand and limestone. 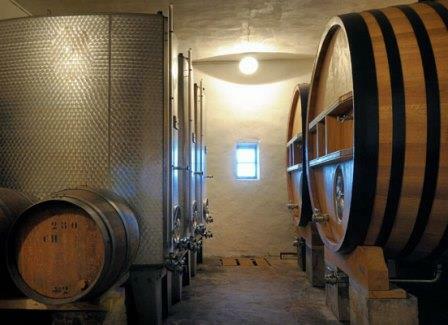 The wines are aged mostly in with 10% of the wine being aged in foudres and old, French oak barrels for for 12 months. The production averages 3,500 cases per vintage. Domaine de Saint Siffrein Chateauneuf du Pape Terre d’Abel is usually a blend of 80% Grenache and 20% Mourvedre, although you can also find Syrah included in the blend as well. The terroir is mostly galets, but there are also soils with clay, sand and limestone. The vines used here are old vines that range from 60 years of age to more than 100 years of age. Although the blend can vary depending on the vintage. The wine is aged in a combination of vessels with roughly 70% of the wine aging in foudres and the remaining wine is aged in used, French oak barrels. The production is quite small with less than 200 cases per year being produced. Domaine de Saint Siffrein Chateauneuf du Pape Blanc is a blend of 35% Grenache Blanc, 30% Clairette, 15% Roussanne, 15% Bourboulenc and 5% Picpoul. Domaine de Saint Siffrein can be enjoyed popped and poured, or decanted for about 1 hour or more. This allows the wine to soften and open its perfume. Older vintages might need very little decanting, just enough to remove the sediment. Domaine de Saint Siffrein is usually better with 2-4 years of bottle age. Of course that can vary slightly, depending on the vintage. In the best vintages the wine should be consumed within 3-12 years after the vintage. Domaine de Saint Siffrein is best served at 15.5 degrees Celsius, 60 degrees Fahrenheit. The cool, almost cellar temperature gives the wine more freshness and lift. Domaine de Saint Siffrein is best served with all types of classic meat dishes, veal, pork, beef, lamb, duck, game, roast chicken, roasted, braised, stewed dishes, sausage, barbecue and cassoulet. Domaine de Saint Siffrein is also good with Asian dishes, hearty fish courses like tuna, mushrooms, pasta, cheese, eggplant and tomatoes. The white wine of Domaine de Saint Siffrein is best served with a myriad of different seafood dishes, shellfish, crab, lobster, sushi, sashimi, chicken, pork and veal, as well as Asian cuisine. Deep, and moody, spicy and herbal, the dark, spicy red fruits appear with ease. The wine is full bodied, rich, lush deep and long. The fruit is as spicy as it is sweet. There is length and density, along with freshness and depth of fruit here. The wine was made from 65% Mourvedre, 20% Syrah and 15% Grenache. The peppery notes are strong here, which is a good thing as it really adds to the fruit. The wine is supple, fresh, juicy and sweet, with a lush, deep finish. The wine was made from blending 65% Grenache, 15% Syrah, 15% Mourvedre and 5% Cinsault. Give it a few years in the cellar as there is potential for aging here. Deep, dark and richly textured, with loads of lush, fat, ripe dark, red fruits, spice and earth. The wine has length and concentration with a peppery, dark kirsch character. The wine was made from 80% Mourvedre and 20% Grenache. Peppery red fruits, a medium body and loads of juicy, fresh, ripe, sweet, black raspberries are what you find here along with more of that herbal infused, peppery, red berry charm.. The wine was made from blending 65% Grenache, 15% Syrah, 15% Mourvedre and 5% Cinsault. Medium bodied, with a mineral driven, spicy, fresh, herbal infused, peppery, red berry charm. A few years in the bottle should add more softness and complexity to the wine. Spicy plum, earth and garrigue notes, with a meaty personality and slightly dry, tannic finish. Dark in color and fruit, the wine is meaty, smoky, rich and concentrated with peppery dark, ripe cherries, thyme and black raspberry notes. Full bodied, round, concentrated and even though it's quite young, it's already displaying sweet, lush, black raspberries, kirsch, thyme and fresh herbs. The wine smells great and feels just as good on your palate. Focused on the red fruit of the style range. With air, the garrigue and fresh, spicy, tannic, dark red fruits began to show, but it took some time in the glass for its character to emerge.